3D printing has found its way into multiple classes at the Hun School of Princeton in New Jersey. 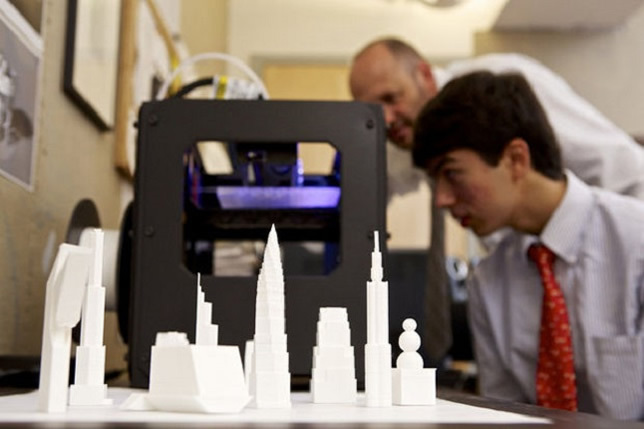 With two 3D printers available in the science and visual arts departments of the private school in central New Jersey, its 600-plus students and teachers are finding uses for them in everything from visual artistry and mathematical discovery to their own scientific research and development of problem-solving skills. "We are just beginning to explore the ways in which 3D printing can be used in an academic setting," said Hun School Science Chair Bernard HP Lockhart-Gilroy. In his physics class, Lockhart-Gilroy is using it to model three-dimensional geometric shapes. "It's difficult to conceive three-dimensional representations of mathematical functions," he said. "Now we can give the printer an algorithm or formula and we can make it." Last year, the human anatomy and physiology class used 3D prints of bones to scale them to the size they needed, using computer-generated artwork. Two students used it to test a theory that the shape of batteries affects their lifespan and, after plating the 3D printed shapes with silver, effectively made their own batteries. In the visual arts department's computer-aided design (CAD) course, students and teachers created three-dimensional models to make representations of architectural renderings, sculptures and personal objects. "In the visual arts department, we focus on the creative side of design," said art teacher Allan Arp, "but, from a practical sense, CAD can be used in conjunction with 3D printing for many practical purposes."